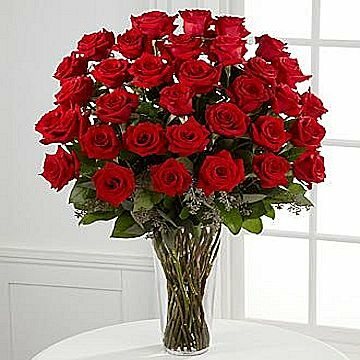 The FTD® Premium 3 Dozen Long Stemmed Roses. Nothing speaks of love so much as a bouquet of 36 beautiful red roses. Arranged with seeded eucalyptus in a classic glass vase, this bouquet is a gift to her heart from yours. Beautifully arranged as a Hand Tied Bouquet, or in a clear square tapered glass vase, these bouquets send your warmest sentiments with glamour and grace.